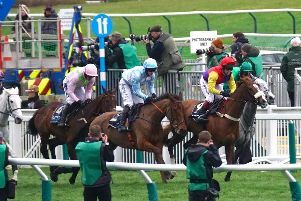 The National Hunt season gets into full swing this weekend with the three-day ‘Open’ Festival at Cheltenham and a great card locally at Wetherby. The ToteScoop6 Handicap Chase is the feature race at Wetherby and I am hoping that Sue Smith runs De Vous A Moi. The Bingley trainer loves having a winner at Wetherby and this seven-year-old looks a promising young chaser. The Channel 4 cameras are covering this race and the handicap hurdle, where it may pay to side with Hartside. Trained near Barnsley by Peter Winks and ridden by son Ryan, this horse boasts a course win and form on heavy ground. At Cheltenham the Paddy Power Gold Cup is the feature race of this superb Festival. The race was established in 1960 as the Mackeson Gold Cup and only four Yorkshire-trained horses have ever tasted success. L’Antartique in 2007 was our last success but I am hoping Malcolm Jefferson’s Oscar Rock can strike a blow for the North this year. Oscar Rock arrived in Malton with a big reputation but never really took to hurdles. Since tackling the bigger obstacles he has really flourished and Jefferson is expecting a big run on Saturday. Buywise was fifth in the race last year and his come- from-behind style of running could be ideally suited to a race that will be run at a true gallop. He looks the biggest danger to Oscar Rock. Any Currency is an old favourite of mine and I will be backing him to win the Cross Country Chase on Friday at Cheltenham. He is 12-years-old now but ran well in a veterans chase recently and loves this unique course. The Cheltenham meeting concludes on Sunday with the Greatwood Hurdle. Dan Skelton’s Superb Story won at Wetherby in October in impressive style. He gets into Sunday’s race off bottom weight and can make his presence felt. Paul Nicholls’ Old Guard looks the one for the forecast.